You stand there in the dank drizzle for hours, having woken up at 5:00 a.m., crawling straight from bed into hopefully impermeable chest waders and heavy fleece. Then you stand in the bow or stern of a pitching drift boat, buffeted by bouncing currents and the odd submerged boulder. You stand there and watch and wait, focused on your day-glow topped “strike indicator” (snob name for a bobber), willing it, willin’ it to dive down like it really means it, like it’s on a mission, a mission from god. Ninety-five times in a hundred the submergence of said bobber is caused by a root or log or maybe an underwater Pleistocene stone the size of a Volkswagen. When you are in a boat screaming down river and your fishing partner is at the other end with his line unfettered, the only option available when you snag is to point your rod and grab your line until either the monofilament leader snaps or the hook breaks free. Usually it is the line, which means putting on a new rig. But this is a game played on the bottom and if you aren’t losing gear you aren’t fishing. Every so often though, your indicator dives and when you pull up with purpose, something unseen down there pulls back. They are often so big that for a fraction of a second you are fooled that you are fouled. But then no, there is the telltale head shake and a couple of solid pumps and then you know whatever is at the end of your line, it is alive. If there was any doubt the fly-line now peeling off your reel persuades you otherwise. Yep, you’re on. A month ago, I chalked up my third consecutive annual trip to fly fish for steelhead in the Roseburg, Oregon area, fishing for steelhead trout in the Umpqua River or one of its tributaries. Twenty years prior to my first pilgrimage to the Umpqua, I angled for steelhead in vain, usually taking the Lord’s name in the process. I fished the Skykomish and the Stillaguamish, the Bogachiel, Hoh, Soleduck, Queets and Kalama. I fished the Nehalem and the Methow, I fished the Green. I even tried the Puyallup. In angling terms, catching no fish is often described as having no luck, but the utter futility of my performance over such an extended period surely pointed to a dearth of skills more than an absence of good fortune. They say it takes a thousand casts to catch a steelhead, but I easily made 10,000 throws without losing my virginity. With such a record of futility, not to mention advancing age, it is not surprising that I now treasure every milli-second I spend tethered by my weight-forward floating fly-line to steelhead. They are not a common catch for anyone, but consider that, even with my modest angling skills, I tie one hand behind my back by insisting on fishing with a fly rod, which is more suited to dalliance with dainty brook trout than these brawling mariners. These are truly magnificent fish that live lives of constant danger, adventure, and world travel. They are the anadromous equivalent of the Dos Equis Most Interesting Man in the World. Steelhead bear a similarity to salmon in that they are born in freshwater, migrate to the salt and then return again to the fresh H2O after growing to unbelievable size, for the purpose of procreation. However, unlike salmon, steelhead don’t just get laid once and croak. Emaciated though they are from their subaquatic coitus, steelhead shake it off and beat it back downstream, making for the ocean if they can make it. Few survive the trip, but some do. These fish are not quitters; they are a beautiful and angry fish. This year’s trip to the Umpqua, taken with my regular angling amigo and former partner in crime (nothing worse than misdemeanors), the Birddog, aka Donald Hurley, aka el Presidente of Shoremaster Inc. Mr. Hurley insisted that he could not travel to the West for work (Seattle Boat Show) without tacking on a trip to the Umpqua. Who was I to argue? I packed two days of shore lunches for us and our able guide Mike Assink, who rows a boat probably 300 days a year putting anglers over steelhead and salmon. The lunches consisted of sandwiches on steroids, piled high with rare roast beef, provolone, shaved dill pickles and thick slabs of sweet onion, set off with extra hot horseradish. A few cans of beer and a flask of the scotch whiskey Laphroig were necessary for washing down purposes. 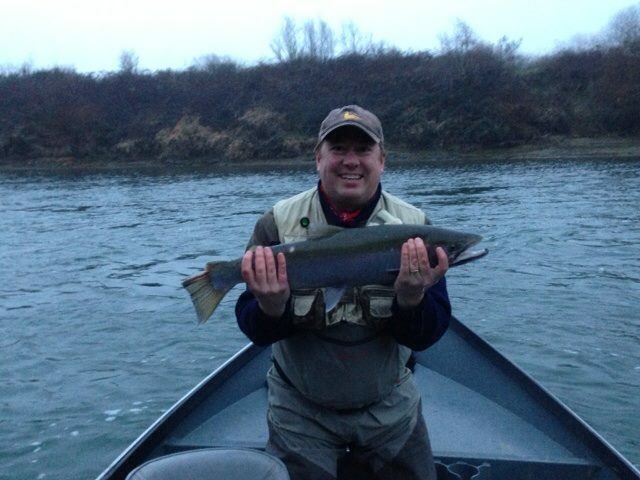 Our first day fishing, like many days chasing steelhead, was a bust. I hooked up with a decent fish on one of our first passes still in the gray of the morning and fought the fish to the gunwales, only to lose him when he handcuffed me with a desperate last dive hard under the boat which broke the line. Over eager to put him in the net, I horsed him too hard at the end – my bad. That was it for day one. We fished the rest of the day without a certain take, trying every trick in the book. As my father always used to suggest when being skunked, we fished hard. Fortunately the day turned out to be a rare brilliant blue sky day, a rarity here in late January. The next morning we again woke ungodly early and drove back to the put-in, a “boat ramp” that was actually a 100 foot mud/gravel slide down a steep embankment. Here, you take your flat bottomed drift boat off the trailer and literally push it off the edge of a steep bank, where it hurtles down through the brush while you hold on “steering” the vessel. Like many things in life, you push off and hope for the best. Fortunately, we were with someone in Captain Mike who knew what he was doing. My visions of being run over and paralyzed by a careening drift boat fortunately did not eventuate. Once on the water, things got decidedly better. Birddog uncharacteristically missed a strike on our very first pass, but then on the next run I hooked up and landed this nice fish after a righteous battle. This time I let the rod tire the fish and he ended up in the net. He came out of the water for a quick photo op and then back in the drink where he could breathe again. Later I hooked up again in the same hole, this time with an even larger specimen, a really gorgeous wild steelhead of perhaps 14 pounds. Adipose fin intact (indicating he was not from the hatchery, where they clip the fins), he was slipped back into the water post photo-op, where he scooted off, barely phased by a twenty minute struggle that made my elbow throb. and then finally the Dawg finished off with the last fish of the day. By 2:00 p.m. we had put 5 gorgeous wild fish in the net, releasing all five as per Oregon State regulation and our own ethical code. Wild steelhead are hammered by habitat degradation, overfishing, and variable ocean conditions. Once upon a time, fisheries biologists and lawmakers thought that introducing hatchery fish into the mix would be a viable solution to allow continued harvesting of steelhead by sport anglers, not realizing that things like mixed genetics and over-competition would have a seriously detrimental effect on their wild brothers. Look, I am certainly not above whacking a legal hatchery steelhead that reaches my net – they are mighty tasty and I admit my heart skips a little beat when I see that adipose fin scar that allows me to punch my steelhead ticket. But the truth is that nothing would do more, faster to boost wild steelhead runs than eliminating hatchery programs. Coupled with habitat restoration, clean water initiatives, and sensible harvesting regulations, wild runs could easily recover to the point where keeping native fish could again be allowed, if that’s your bag. My hardware and bait pulling angling brothers and sisters often hold an opposing view on this, but we just have to agree to disagree. On this issue, I’m with the wild things. Back on the Umpqua, life/work considerations required an early end to our angling, sad to say. With a five hour drive home ahead, part of it through Portland’s rush hour, we broke camp early and headed back to civilization. Our whippy rods were returned to their protective aluminum tubes and we packed away wet wading boots. Mobile devices held numerous stills and videos of another adventure, soon to be shared via several social media outlets. However not even Instagram digital enhancements could ever beat the indelible images now stored in our intracranial hard drives. First things first, you will need to procure a fresh fillet of steelhead. If you are not in a position to whack a hatchery steelhead that you caught yourself, Monterey Bay Aquarium Seafood Watch lists farmed steelhead as a “best choice”, so knock yourself out. 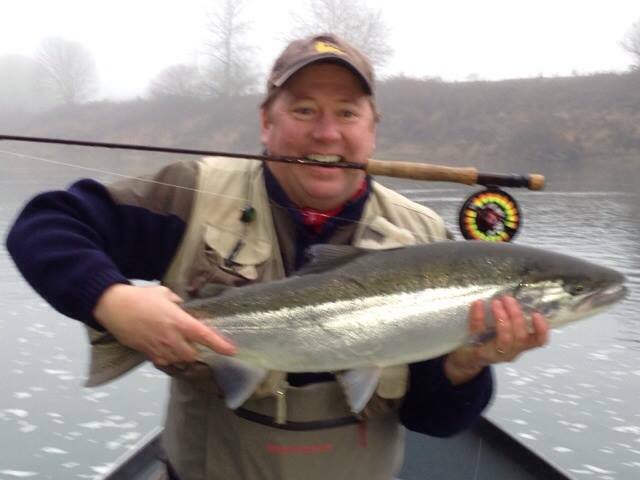 Unlike farmed salmon, farmed steelhead are good eating. Any way you go you are looking for flesh with a pearly sheen, not dried out. 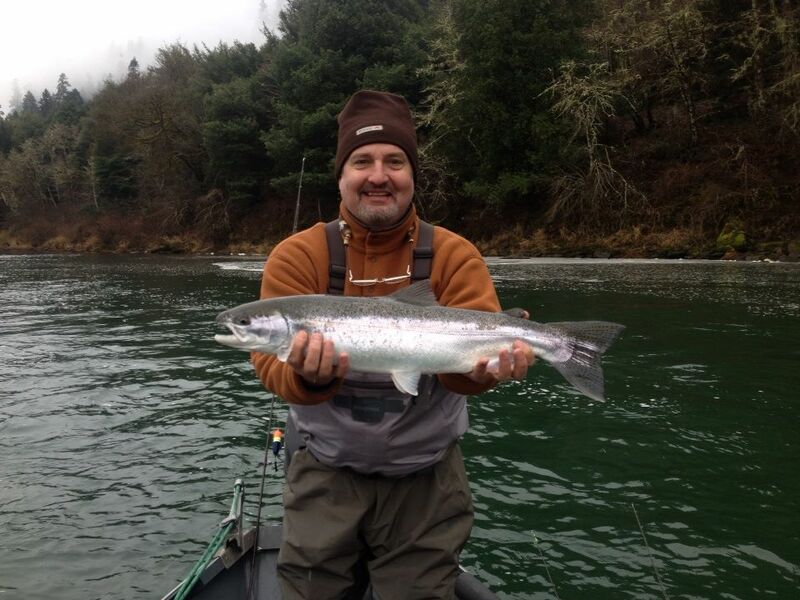 Frozen can be OK with steelhead. 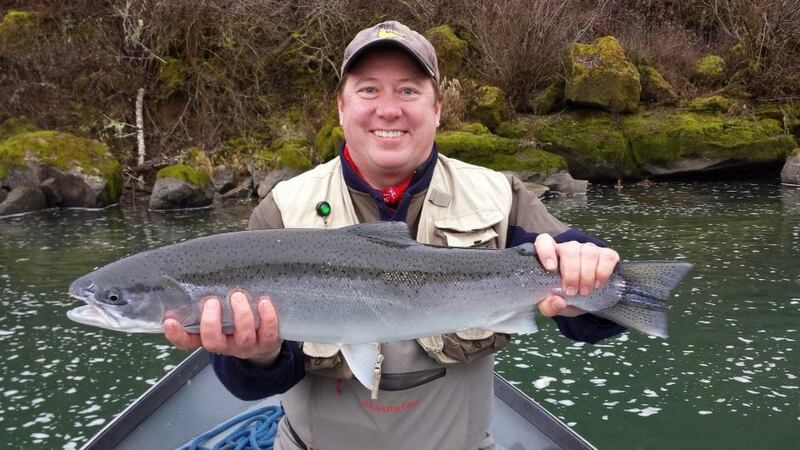 Once you have found yourself a slab of nice steelhead, the rest is easy. I like lentils with the dish because Washington State produces more lentils than any other state in the U.S. and because, well, I like lentils. Lay out filet on a board, drizzle with olive oil and season liberally with salt and pepper. 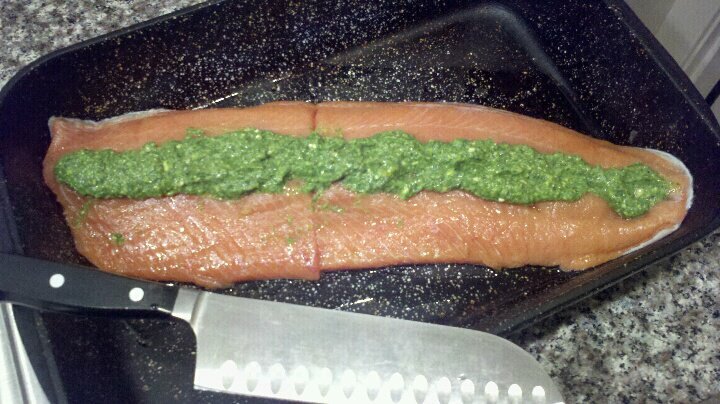 Run a thick line of arugula pesto down the middle of the filet. Place large bunch of leafy (vs. stemmy) arugula in a food processor with a couple cloves of garlic. Whirl away until well chopped. Add juice of half a lemon, salt and pepper to taste. While motor is running, drizzle in high quality olive oil until the arugula mixture forms a medium thick paste. A nice jammy Oregon Pinot Noir would go nicely with this dish. I am especially fond of the St. Innocent label.